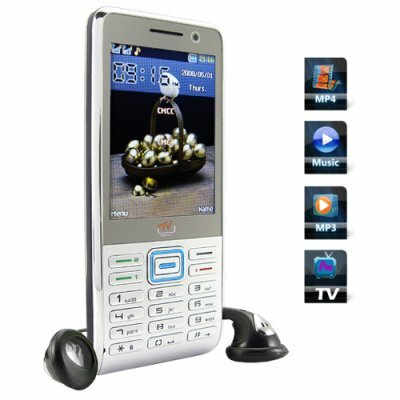 Successfully Added Quadband Dual SIM GSM Worldwide TV Cellphone to your Shopping Cart. Quadband Dual SIM GSM Worldwide TV Cellphone. This is a stylish four band GSM cellphone coming in a slimline form factor, housed in a brushed metal casing with chrome accents. Featuring a high quality 2.6 inch screen, this dual SIM phone is fully unlocked, and comes with full native quadband functionality (850MHz, 900MHz, 1800MHz, 1900MHz) to work on any network or carrier of your choice right out of the box. This compact mobile phone also comes with some great entertainment options. Superb functionality lets you watch analog TV using the SECAM, NTSC and PAL broadcast standards. This ensures that you have near global coverage and reception with this stylish phone. Enjoy watching analog TV with friends on the high-quality 2.6" screen with clear visuals while you are on the move. Have the freedom to watch your favorite TV whenever you want, wherever you want. A whole host of other great multimedia features include an onboard digital photo camera, digital video recorder, music player, FM radio, video player and ebook reader. With great phone functionality alongside MMS/SMS, a handy Contact Book and WAP Internet access, and Bluetooth, you can conveniently stay connected with this phone wherever you go. Enjoy the flexibility of great call handling features such as speed dial, caller ID, call divert and call waiting to easily manage your calls along with useful PDA software tools including a calendar, To-Do List and Alarm ensure that you always stay on top of both your work and your social life. The CVIL-M39 also comes with a convenient and responsive motion-sensitive accelerometer to always keep you in control, simply tilt or flick the phone to take control of its great multimedia functionality: change the wallpaper, change music tracks, change TV channels, change FM radio channels, and so much more! The phone's user friendly menu interface will give you easy access to all of this phone's great features. With the flexibility of so many options and functions for every occasion, this is a great phone to own for work or for play. Whether you want to organize your work life or manage your social life, the CVIL-M39 does it all easily and with a touch of style. A stylish mobile companion to own, this would also make the perfect gift for your family, friends or colleagues. The CVIL-M39 Quadband Dual SIM GSM Worldwide TV Cellphone is proudly brought to you by the leader in China Wholesale Electronics, Chinavasion. Order this great phone today and don't forget to look at our Bluetooth adapter section of the website for stylish earpieces and other great accessories you can utilize while you are making calls while on the road. Additional Functions: Video player, audio player, digital camera and video recorder, E-book reader, TV, TV record, FM Radio, sound recorder, Calendar, To Do List, Alarm, Calculator, Stopwatch, Call Secretary. The phone was great, very slim compare to the others. The TV reception is clear and also the phone was in desirable shape. on 2010-01-31 18:01:19 Πολύ καλό οικονομικό τηλέφωνο !!! Λεπτό, ελαφρύ, καλά ελληνικά, πολύ καλό για την τιμή του, το παρέλαβα σε 8 ημέρες, ευχαριστώ πολύ την Chinavasion !! on 2010-01-29 20:34:33 Super Phone. Ordered phone on Thursday arrived in Ireland on the monday.Amazing delivery speed.All features on phone work well.Radio not great as ariel needs to be up to find a signal and at the moment cant find out how to get books on the ebookHopefully soon.Picture quality is excellent.All in all a super phone for a super price. Have already ordered 2 more...Thanks chinavasion. on 2010-01-21 15:07:01 The Excellent telephone for their own money! Отличный телефон за свои деньги! Прекрасный перевод на русский, телевизор с Secam, Очень практичный, легкий, комфортный телефон! The Excellent telephone for their own money! The Beautiful translation on russian, television set with Secam, Very practical, light, comfort telephone!